At least nine people were killed and several wounded when a car loaded with explosives blew up near a mall in a busy market in Somalia’s capital Mogadishu. “The blast occurred close to Mogadishu mall and it has caused death and destruction,” police officer Ahmed Moalin Ali told AFP news agency. 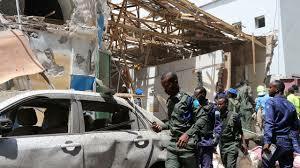 Mogadishu is regularly targeted by Islamist militant group al-Shabab.